It's time for me to memorize something fun. 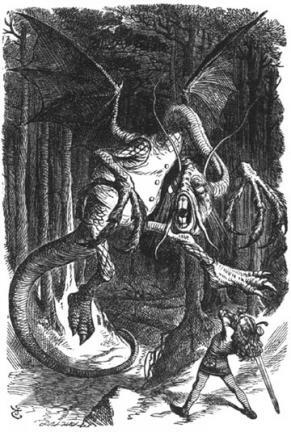 So this week, I'll tackle Lewis Carroll's "JABBERWOCKY"
You just have to appreciate someone who can communicate more with made up words than most of us can with technically correct sentences. This is a family favorite! I read what you wrote recently about the power of committing good things to memory...I was embarrased that I couldn't remember Invictus, so I got a copy and went to work..I shared it w/Tyce and he really enjoyed it. Thanks for the wise words! Cute! I admire those who enjoy memorization. I prefer the one thing I did memorize with longevity..a quote from Einstein, who reportedly could not memorize his own phone number! He said, "never memorize what you can look up." I think I got that right! the cheshire cat sings this in the disney version. good luck! My mom used to quote this to me when I was young!